Danglepod, photographed at Green Cay Nature Center, Boynton Beach, Palm Beach County, in July 2013. 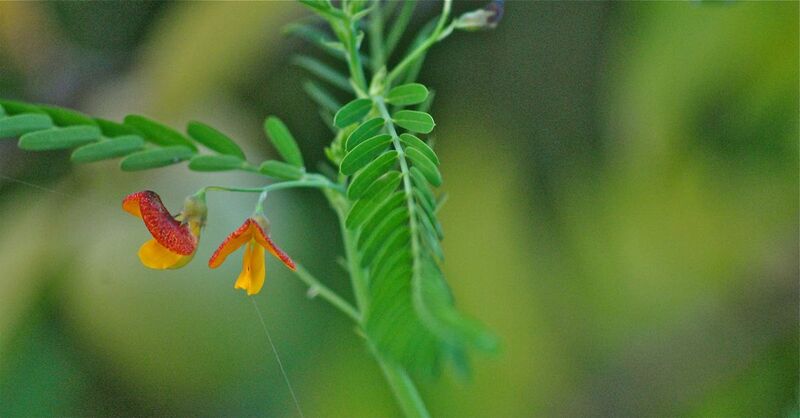 Danglepod, Sesbania herbacea, seems at best to have something of a mixed reputation. On the one hand, it is a legume and helps improve the soil by fixing nitrogen from the air. It has beautiful but small flowers, attracts beneficial insects and it is a host plant for at least one species of butterfly, the ceranus blue. On the other hand, it's considered a noxious weed in some places because it can spread like crazy and overgrow crops. It's also reportedly poisonous to foraging animals, though some dispute the claim. Danglepod is a Florida native, found in most of the state's 67 counties, particularly in the Peninsula. Its native range extends over much of the eastern and central United States as far north as New York, west to Texas, Arizona and California. It's also native to the Caribbean, Mexico, Central America and South America. It's a tall, woody plant capable of reaching a height of 10 feet. In fact one of its former scientific names, S. exalta, means extremely tall and one of its common names is peatree. It has few branches; they'rere green when young and turn woody as they mature. The leaves are compound and arranged alternately on the stem. Each leaf has between 20 and 70 leaflets that are opposite each other. Flowers emerge where the leaf joins the stem. Flowering season is summer and fall. The fruit is a long pod that can contain 30 to 40 seeds each. In warmer climes, danglepod is a perennial but an annual in cooler places. It does not tolerate frost. It grows in wet habitats, where we found the plants on this page, as well as dry. 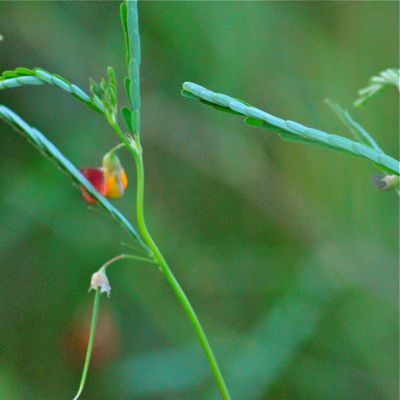 Farmers have used danglepod as a cover crop or as a green manure, particularly in California and Arizona, rotating it with corn and tomatoes and other vegetable to take advantage of its nitrogen-fixing ability. Used on the borders of orchards, it attracts birds and beneficial insects, including lady bugs and parasitic wasps. Then again, danglepod also attracts a variety of pests, such as aphids and whiteflies. On the plus side, it is an important spring time food for turkeys, quail, mallards and limpkins because the seeds tend to stay on the plant through winter. 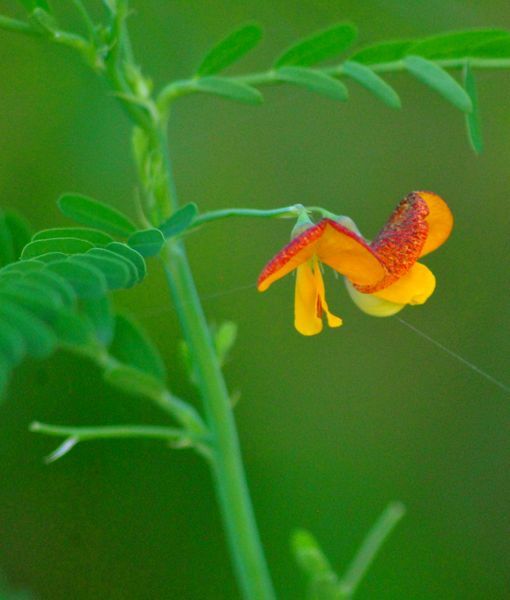 Danglepod is high in protein but it also produces a group of chemicals call saponins that are toxic; there have been reports that cattle grazing on danglepod have died. On the other hand, other experts say that saponins are not toxic to ruminants — animals, like cows, that have multiple stomachs. The debate lives on. The Yuma tribe of the Southwest used fibers from danglepod bark to make nets and fishing line. Danglepod is listed as a noxious weed in Arkansas.